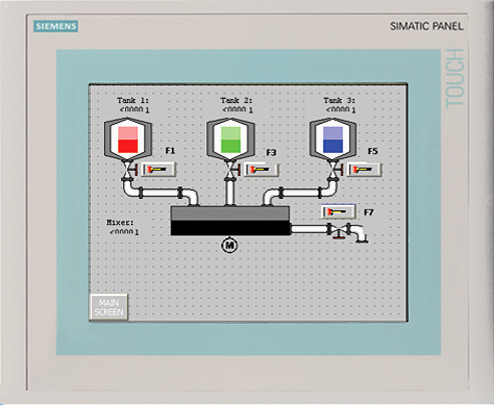 The PLC Touch Screen Learning System – TP1200 (89-HMIS7A) adds to the Programmable Controller Troubleshooting Workstation (890-PECB) and Siemens PLC Troubleshooting Learning Systems (890-S7312B/890-S7315B) to teach machine control and monitoring applications using the Siemens TP1200 HMI panel. An HMI (human machine interface) panel provides interaction between users and a PLC-controlled system allowing the operator input control and output display of a machine or multiple machines. HMI panels are rapidly replacing traditional hard-wired control panels in the workplace. Typical users of the HMI panels include machine operators, maintenance technicians, and supervisory personnel. The HMI training system includes: HMI panel with keyed module frame assembly, 24 VDC power supply and power cord assembled as a single unit, Profibus DP/MPI cable, ProTool CS Software, student learning materials for both theory and lab, and a teacher’s assessment guide. Students will learn how to operate and configure the HMI panel, as well as how to transfer applications to an HMI panel over a network.